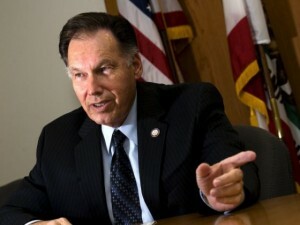 The Orange County District Attorney, Mr. Tony Rackauckas, has a pretty miserable record holding public officials and cops accountable for their misbehavin.’ It took a dead man and a killing caught on video to get him to prosecute FPD cops Manny Ramos and Jay Cicinelli for the beat-down they instigated and laid on Kelly Thomas. Even that prosecution was touch and go. And for years we have been seeing T-Rack investigatory work product that was just an obvious nothing. Now we have the interesting case of Joe Felz’s Wild Ride, in which the Fullerton cops apprehended the former City Manager after he jumped a Greenwood Avenue curb, ran over a tree and tried to drive away. The police on the scene administered no breathalyzer test even though they smelled alcohol about Felz’s person. Instead of a ride to HQ, the cops gave Felz a ride home, with no questions asked. The city sent the case to the DA to examine – something – nobody knows what for.